Love Scrivener? Me too. This insanely comprehensive word processor, designed to help authors organize all their writing notes and files in one place, is arguably the single best digital tool for writers ever created. These days, I use it exclusively for my fiction (buh-bye, Word), and it is constantly helping me refine my approach to writing. This is why I wanted to share with you a free Scrivener template, based on my own process. A few years ago, reader Stuart Norfolk, from England, put together a great Scrivener template, based on my books Outlining Your Novel and Structuring Your Novel. At the time, I was just getting started using the program myself and didn’t have much input to add to the template. Now that I’ve used Scrivener to create two novels, this feels like the perfect time to update his template with not only important info from my book Creating Character Arcs, but also the folder system I use for keeping track of all my notes. You can download the free Scrivener template by inputting your email address below. You will be added to my mailing list and redirected to the download page (scroll to the bottom of the page to find the template). After downloading the template onto your computer, make sure you copy/paste the files out of the zipped folder onto your computer before trying to open the template in Scrivener. Otherwise, the program won’t recognize the template has been installed. Double click on the project.scrivx file to import it into Scrivener. To get the template to show up in Scrivener as an option the next time you start a new project, you’ll need to save it as a template (File/Save As Template). When you first open the template, you’ll see a number of folders. Those at the top will walk you through creating your outline and other preparatory stages, including character development and worldbuilding (although you can find more comprehensive help with this in the Outlining Your Novel Workbook software). From the Manuscript folder down, you’ll find the exact set-up I use when organizing and writing my own stories in Scrivener. The template is designed for you to be able to work your way down from the top folder, intuitively. Sometimes, questions are offered to help you start brainstorming. Other times, you’ll find instructions with suggestions for how to use various sections. Ultimately, this is only intended as a guide, both to show you how I work and to give you ideas for adding to or streamlining your own process. Adapt it to your own needs by deleting what doesn’t work and brainstorming new additions. Give it a try! If you haven’t yet tried Scrivener, the program is a steal at $40 and offers a free 30-day trial. Wordplayers, tell me your opinion! What does your standard Scrivener template look like for writing your fiction? Tell me in the comments! I used Scrivner as well. I tend to layout my work per the outline I use. I recently started using your software and found it very useful for fleshing out characters and fixing plot holes. If the software exported to Scrivner, that would be awesome. The outlining program does offer the capability to export the scene-list portion as txt docs, which you can then import into Scrivener and other word processors. This video shows you how. We’re currently working on expanding other areas of the program for exporting. I’m glad to hear this, I think it will be very useful to be able to export things like the character sketches to Scrivener. At least part of the character interviews should be available for export in the soon-to-be-released update. Thank you SO much for this template!!! 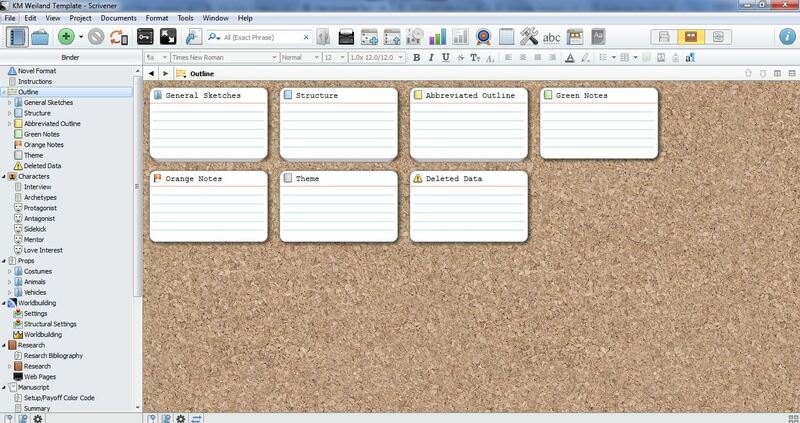 I am learning Scrivener and already outlining with it, but this template is amazing!!! Thank you!!! Scrivener is my favorite thing. This template looks super helpful! I’ve been training some clients on it recently and once they learn it they LOVE it, so I’ll have to save this to share. Yes, it’s definitely got a (sometimes prohibitive) learning curve. But once you figure out the basics, it’s actually very intuitive to use. Oh my gosh! This template is fantastic! I’ve spent a lot of time perfecting mine but yours is so much better! I’m going to have to merge it with my WIP so I can use all your tips. Thanks so much, Katie! Smart! Thanks for sharing that. Magnificent! Dragged your percentage flags into my existing Scrivener mss and it gave me immediate insights about how the second half of the second act could twist out… many thanks! Cool beans! Yes, structure in the Second Act is particularly helpful for avoiding that “saggy middle” problem. Bad gateway” when I subscribed. I apologize. The server has been spazzy for the last couple of weeks. Give it another try. If you get the same error, shoot me an email and I’ll make sure you get the download. Does your template work on Windows or is it Mac? I designed it on a Windows computer. However, I’ve had Mac users test it as well with no problems–so it should work fine whatever your operating system. I’ve been using Scrivener for years but it is always healthy to try something new. That said, I do have your outlining books and the character arc one, too. I live in the UK, so I am guessing that the webinar will be 9pm for us on this side of the pond. To be truthful, I get up at 6am, so am normally asleep at this time. Is there an opportunity to catch up with the webinar, say, on Friday morning?? No problem! There will be an on-demand replay available for about five days after the live event, which you can watch whenever is good for you. Scrivener is my bread and butter. Thank you so much for sharing your template, I’m going to follow it top to bottom to get extra traction on my next novel! The nice thing about Scrivener’s free trial is that it is good for 30 non-consecutive days … emphasis on the “non.” I’ve had mine for at least a year, opened it today and it said I have 28 days still to go! Good to know! Thanks for sharing, Phil. What an excellent resource!! Can’t wait to try it out. Thanks! I’m a new user to both Scrivener and Outlining Your Novel software. Both look useful and I look forward to learning more on how to use them together. Thank you for sharing this template! The prop section reminded me of how much I keep in my head that I really ought to be organizing. The set-up/payoff section has me smacking my forehead; I was using color-coded Excel sheets to track down loose ends. Honestly, the whole template is inspiring. Thank you so much for this. And thanks to Loretta above for the tip! Set-up/payoff was something I started doing in my most recent WIP. It’s been a HUGE help. I watched the webinar this morning and my mind is officially blown! Is the Scrivener program really just $40 right now?? Also, I am debating about the bonuses; another $200 is tight right now, but I would really love the Learn Scrivener Fast series. Is there any way I can still purchase it in two weeks? My third question is, I currently work in iBooks author. I noticed during the demo that you can export to this, but can you import from it? iBooks works in chapters automatically and I’m wondering if I’ll have to copy and paste each chapter or will it just flow in as one doc? Thank you so much for you time! I’ve already downloaded a few of your books and the template. Really looking forward to working with Scrivener and learning more, and following you! Glad you enjoyed the webinar, Jennefer! Yes, Scrivener is always priced at $40. Joe is only offering the discount on his course through Monday. I’m not personally familiar with iBooks author, since I’m a PC user. Compatibility would depend what file type iBooks puts out. I can’t organize so your template is fantastic. I’m a little confused about the manuscript section though…am I only supposed to write in the notecards you put down, or am I supposed to make my own notecards for other scenes within the structural beats? Also, how would you suggest going about the whole Normal World vs. Story World thing for a contemporary where the characters don’t physically leave their home area? I find the concept intuitive for sci-fi, fantasy, and contemporaries where the characters travel around, but less so for stories where they don’t. Yes, you’ll want to adapt the Manuscript section (and, indeed, all the sections) to your own needs. Use the structure I’ve provided as a jumping-off point to add more scenes of your own. I’m going to be addressing the Normal World in next Monday’s post, so stay tuned! But, for now, suffice it that the physical setting doesn’t necessarily have to change to a different setting after the First Plot Point. It can change within itself, in essence *becoming* the Adventure World. I know people have gotten it to work. However, I believe you’ll first need to unzip it and install it on your desktop computer. Then save it to Dropbox and sync it to your iOS version of Scrivener. Any insights on how to approach rewriting my Scratch Draft (Scrivener – 95k words) toward a much-learned-along-the-way official FIRST DRAFT?? After a Full Manuscript Snapshot…should I… 1) read & make project notes into the Old draft? New draft … then… ?? (since there will be many, many changes) copy/paste scene by scene? …OR type ‘fresh’ into a new project file making changes along the way? PS… when /how/why do you break by beats, rather than scenes/sketches/sequels/etc? YOUR BOOKS (every single one) have carried me through these many years. This is my sixth attempt at a novel and the first one I feel where it’s all coming together. My learning curve w/Scrivener on this one is another fear factor for the rewrite. THank you for all your many works. I’d say that depends how rough the scratch draft is. Some of it you may be able to refine. Some of it may need to be totally rewritten. It just depends. Structural beats are broader structural integers than scenes/sequels. They define the story as a whole, whereas scene structure further breaks down the minute parts of the story.